The annual local final of the CFA Research Challenge was held at the Stock Exchange in Madrid on Thursday, March 3. We are pleased to announce that EADA’s team received second place in this year’s local CFA Research Challenge in Spain. 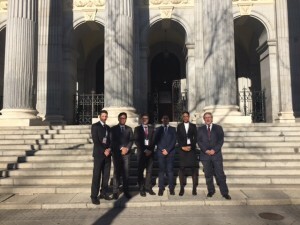 The team was made up of five participants from the International Master in Finance: Stefan Eder (Austria), Luis Mejia (El Salvador), Shaida Sylla (Ivory Coast), Dorian Berndt (German), Jose Christopher Nicolas (Philippines). Participants from the best schools are invited to compete with the objective of compiling a professional analyst report of a publicly listed company (this year Prosegur). According to Dorian Berndt, the most challenging part of the Competition was “realising that knowing the fundamentals of corporate valuation and setting up a model tailored to a differentiated company are two very distinct things”. 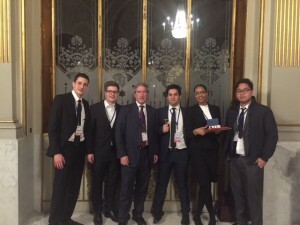 The local CFA competition (in Spain) attracted 13 teams this year and the best financial analyst reports were selected to compete in the final. The group representing EADA was hand-picked in October and worked on the report from November until mid-February.